Mover Leave it to Beamer... What's the Beam done now??????????? I never realized a little dog could have such a big personality!!! Comments for Mover Leave it to Beamer... What's the Beam done now??????????? Love it! A service dog too! Next thing you know he will be tying the laces from both shoes together! LOL Watch out! Cotons are very smart. It's funny he looks like he is watching tv as he is untieing the shoe. I just noticed that. Anyway handsome handsome boy. Are the shoes bigger then he is? LOL. Just love it!!! You are simply gorgeous and look like you are full of fun and mischief. Good for you. That's supposed to say MORE leave it to Beamer. sorry! This is Beamer. After 25 years of Old English Sheepdogs, we finally decided it was time to downsize to somebody more manageable. 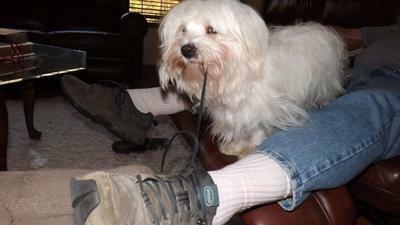 Well, the Coton is the perfect dog for us!. Beamer just turned a year old this week. Here are some pictures of his antics! Comments for "Leave it to Beamer!" I knew Beamer looked familiar. I picked up the other post 1st. I luv the red picture thou since I'm sure for all of us it brings back a funny memory. I do exactly the same thing on mats on Jonah. As the Coton prayer goes. Please God let me wake up tomorrow and not find any mats. So far my prayers have not been answered. LOL. So please it only take 1 min. to take care of that new mat and makes the daily brushing easy peazy. Besides u always feel the mat as they receive multiple pets a day. 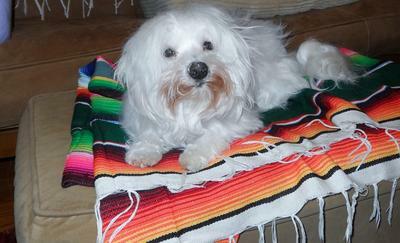 While there is a world of difference between a 100 lb Old English and a 12 lb Coton, they do share one thing. LOTS OF HAIR. I know the biggest problem is the undercoat. It can turn a beautiful coat to a bed of mats in a heartbeat. I have a few tricks. One is besides brushing him I use a metal comb. It seems to get down to the skin better, and ensure the mats are gone. I also cut the mats parallel to the hair rather than cutting them out. I use a pair of cuticle sissors with rounded points, and feel around and cut. I can hold Beamer and feel for the mats, cut them and then they brush right out. You don't get any really short spots that way. Beamer doesn't know what I'm doing, so he remains cooperative. The main thing is watch for that undercoat. When they start blowing that coat, get right on it... Good luck! He is ADORABE... Since ur backgrd is in Old English sheepdogs u could probably help us w/some tricks of the trade in coat management. I am never to old to learn or try anything new for easier coat care so feel free if u have any suggestions. If interested the Crufts Dog Show just ended in England where they show the Coton in the small breed grp. now, where they used to show them in the gun grp. Web search Crufts 2013. They only 2013 video yet is in the Best of Breed 2013 Group judging @ 16:43 into the video is the winning Coton. I hope u keep sharing ur growing up Beamer antics video's with us. he's cute! I clean the food colors of my Cotons face and eyes with a cotton pad soaked in warm water. If that stain is very bad, a little tear free diluted with warm water baby shampoo will do the job.The red brown coloring comes from beets in the dog food. Beamer loves the Doggie shows! Beamer just love to watch dog movies on the computer. He comes and whines to get up in the chair with me and we watch movies at night. His favorite in Cinnamon. She's a Maltese but he is still in love with her! 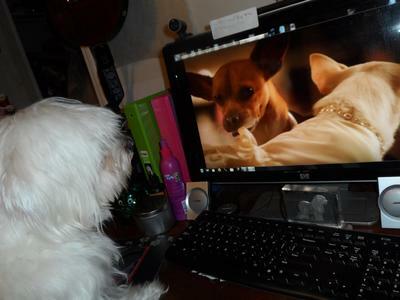 On this particular night he was watching Santa Paws... Another favorite is Beverly Hills Chihuahua! Comments for Beamer loves the Doggie shows! had trouble loading this.. will try again! How funny. Jonah will lay w/me but never pays attention since I to watch alot of those movies plus dogs 101, Purina agility, It's Me or the Dog etc. I have a friend that has Bostons & every time I watch them for him & dogs r on tv they continuousy bark at the tv. Makes it hard on Sat. mornings watching AP. U will have to post a picture of u & Beamer chilling watching ur movies. 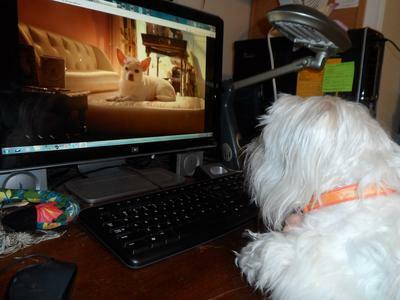 Just have to laugh about Beamer watching the dog movies. Cotton will watch off and on anything with animals in it. She loves the cat commercials for Friskies cat food, and on animal planet she likes the puppy football. It never holds her attention for very long but she knows the music for them and will always run and look for awhile.---just wonder what they are thinking while they sit there. Just have to love these little creatures. They can sure make each day special. I also like the name Beamer. Enjoy! Here are some pix of Beamer. He's known for his love of dog movies, smelling what's cookin', chewing on shoe laces, among other antics. I feel this breed is the best kept secret in the animal kingdom. They are smart, gentle, loyal, funny and will win your heart over in a flash! Sandi, could not agree more, they are a wonderful secret and the most wonderful breed ever......Thanks for sharing the pics and I hope Beamer got a turkey leg to eat. He is just soooo cute. Gotta love 'em! Our Cotons give us joy. Beamer is so cute. 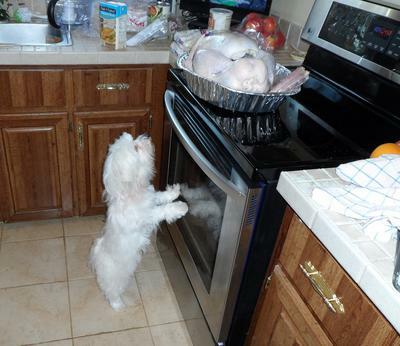 Love the picture checking out the turkey. I bet he couldn't wait for dinner. We had Golden's for many years and then when our last one passed away, we didn't get a dog until we retired. So we decided to adopt and quite by accident we met our Molly when she was being taken off a truck from the Philadelphia SPCA and moved to Last Chance Ranch in Quakertown PA. I can not figure out for the life of me why no one reclaimed this perfect little lady. But decided we were meant to meet her and fall in love. We didn't even know that she was a Coton until a stranger told us to check out the Internet and do some research. Well, you are correct. They are the best kept secret ever and we are thrilled with our Molly. We can't believe what a neat dog she is. Glad you have experienced the same with Beamer. He looks like a little treasure. This photo cracked me up. Luc is also constantly on the lookout for opportunities to get food left unattended. But this would torment him to be so close and yet so far. If I turned my back on him for 5 minutes I'm sure he'd find a way to get that turkey. Beamer is adorable! 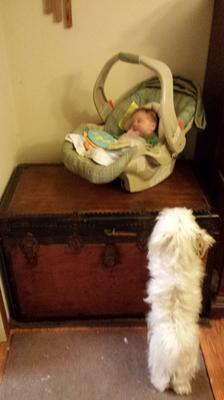 We have a new grandbaby... She's just 6 weeks old and Beamer is fascinated by her! Please note the white hair on the floor is from his trim. He really doesn't shed.. Well, you all know that anyway! Beamer loves the Beverly Hills Chihuahuas! You are so cute watching your shows. Cotton likes the dog commercials also but will come running to see the friskies cat commercial......Go figure? We do feed a couple feral cats so she has bonded with them. Enjoy them little guy, Cotons are so smart! Maybe it runs with the breed - our little guy absolutely loves the tv, knows commercials he likes by heart and comes running when he hears one playing. Shows with animals are his favorite and often can be found laying on the floor in front of the television just like a 5 yr. old kid! Another adorable photo of Beemer. He looks so interested in the movie. That is remarkable. I bet he knows how to get to the Internet too! What a cute picture. Cudos for Beamer for watching such a cute movie. Thanks for sharing.